If you didn’t already know our bodies have what is known as sphincters or sometimes known as valves. 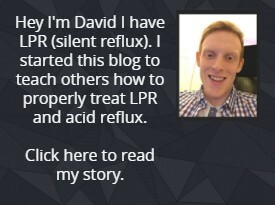 These sphincters play an important role in preventing reflux and more importantly Laryngopharyngeal Reflux (LPR) which is sometimes called silent reflux. This is because said sphincters are meant to close and prevent reflux from occurring in the first place. If you have LPR there is a good chance it is because of 1 or more of your sphincters malfunctioning and not operating as it should. This malfunctioning usually ends up in throat related symptoms for an LPR sufferer. When I say the stomach sphincter the medical name for it is the Lower Esophageal Sphincter or LES for short. A malfunctioning LES is for the majority of LPR sufferers the number one reason why they have LPR in the first place. Of course, it can be related to other sphincters and I will cover them later in the article as well. If you didn’t know the most important sphincter is the LES. This is because it is located directly above the stomach. It is the sphincter between esophagus and stomach as can be seen in the diagram. As you might have guessed this sphincter is designed to remain closed and restricted once food is in the stomach. When it is closed this will keep the acid/food inside the stomach where it is meant to be. Though with an LPR sufferer this valve will sometimes relax and open and this leads to acid being refluxed up into the esophagus and further up into the throat. Usually one of the main reasons for this happening to the LES is from overeating. Overeating causes the stomach to become overloaded. 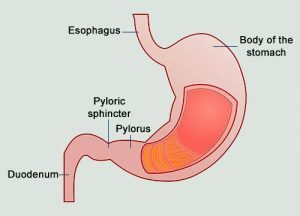 When the stomach is overloaded like this that means more pressure on the LES to keep food and acid inside the stomach. This will often mean more pressure on the LES and this pressure will slowly cause the sphincter to malfunction and degenerate over time. Of course, overeating once or twice won’t cause this. It’s from long term overeating and a consistent slow degeneration over months and years. When I say overeating I mean putting too much food in the stomach at one time. If you didn’t know the amount of food the stomach can hold at once is about the size of your fist. I’m sure a lot of people can eat portions much bigger than this frequently and this is the process that can lead to a malfunctioning LES and LPR symptoms. Below the stomach there is a sphincter called the pyloric sphincter. This sphincter allows food to pass into the intestines from the stomach. How this process works is the pressure builds in the stomach and said pressure should force the food through the pyloric sphincter which is very narrow – even when opened is only a few millimeters wide. The problem is when this pressure gets strong the LES because it is weak will open and become relaxed because it cannot withstand the pressure instead of passing down through the pyloric sphincter. This leads to acid and food being refluxed up into the esophagus instead of being pushed down through the pyloric sphincter. 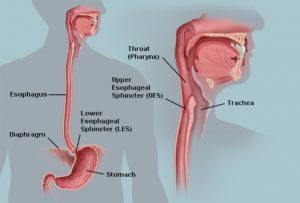 There is another sphincter called the Upper Esophageal sphincter or UES for short. This sphincter is located between the esophagus and the throat and is another barrier against reflux. The UES is usually tighter than the LES and this tightness makes it harder for the UES to open to protect the throat from reflux. An LPR sufferers UES can become more damaged from the acid reflux. It will try and get tighter to protect against reflux which can make it malfunction from this constant cycle similar to the LES. It is also hard for the UES to protect against gaseous reflux and this is a form of reflux that which will particularly bring on LPR symptoms. Once acid and things like pepsin pass through the UES this is where LPR issues arise. It can affect the throat, the voice box, the mouth and even the ears in some people. The main reason for this is called pepsin. Pepsin is used to digest proteins in the stomach and this is refluxed into the throat in this case. This pepsin can cause inflammation and general irritation in the areas I mentioned above. You can read my full LPR guide which covers pepsin in more detail. The best way to treat a malfunctioning LES is through diet. As I mentioned before overeating is one of the main reasons bringing it on in the first place. So, eating smaller meals with the food contents being about the size of your fist. You can still eat as much throughout the day as you do now but just not at one time. Instead of eating 3 big meals at day. Try 3 smaller meals and 2 snacks for example. This will put much less pressure on the LES which will allow for it to heal and return to its proper function. Also, once the LES is working correctly so will the UES as it won’t be being constantly forced to tighten to protect against acid as it was before. Eating smaller meals isn’t the only element to helping LPR. Following a low acid diet and avoiding certain foods that can make the LES weaker is also very important. To give you an example in chocolate there is a thing called methylxanthine which is a substance which causes certain tissues in the body to relax, one of these tissues is the LES and therefore avoiding chocolate would be a good decision. For everything about LPR including treatment advice and my diet recommendation check out my complete LPR guide here. Luckily if you follow this advice the LES can slowly but surely return to normal function and your LPR symptoms should fade away. It may take some weeks if not months, but it most certainly will help over time. Previous articleGERD vs LPR – What is the Difference Between Them?